The Glenmore Sailing Club is excited to partner with Scouts Canada to help youth experience sailing and earn sailing badges as part of The Canadian Path. 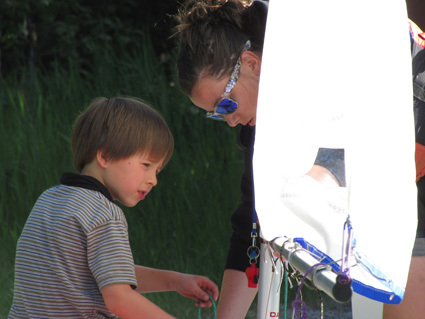 The Glenmore Sailing Club has been teaching youth sailing skills for decades. 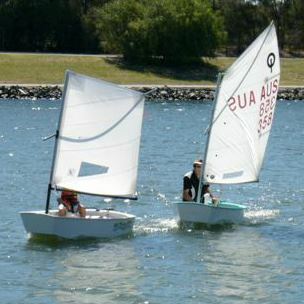 Courses are taught using the Optimist sailboat (photo above). Here's what you need to know before, and while, the kids are sailing with us. This 3-hour course, during May and June, is a good place to start. This course is offered six times per week and includes theory and a minimum of 1 hour of sailing. 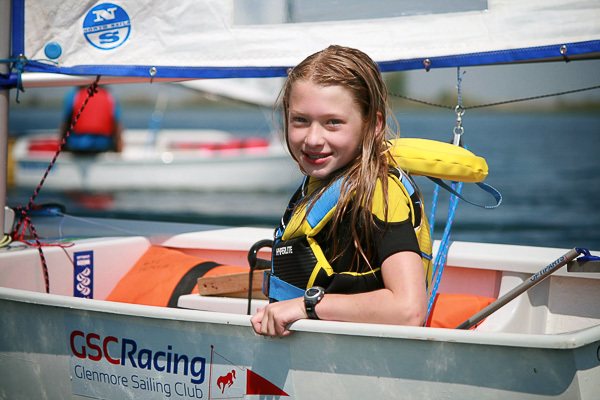 The Club's summer sailing camps teach fundamental sailing skills on land and water in a fun, safe week-long camp. 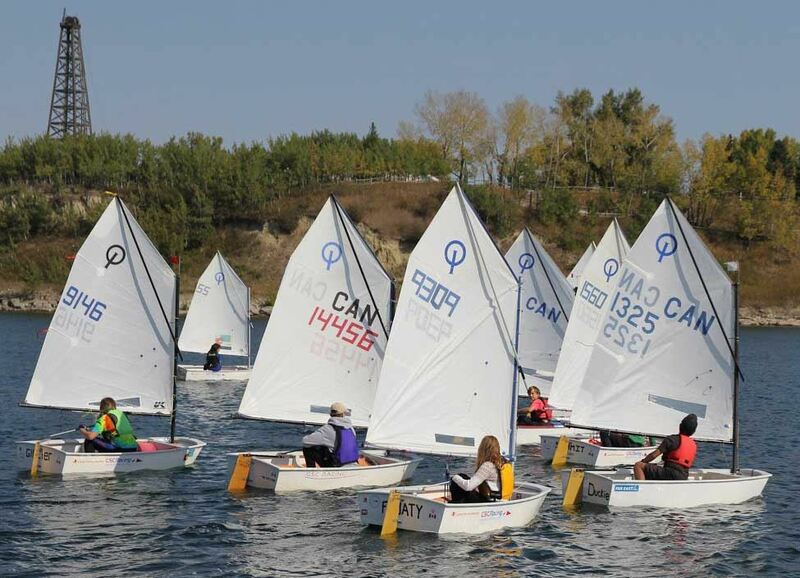 Has the Glenmore Sailing Club signed the Scouts Canada Indemnification Agreement? Do we need a membership at the sailing club to take sailing courses? What is the ratio of youth to sailing instructors? Very. The Optimist sailboats we use to teach new sailors are stable and easy to sail. Specifically for the Scouts Sailing program, the Club has purchased a Reduced Area Design sails for the Optimists. These sails will be used when there is a bit more wind because we want to ensure the kids have a great experience sailing. In this picture, the RAD sail is the one on the left, the regular sail is the one on the right. They are great sails. The Sailing Club has a coach / safety boat providing instruction and ensuring youth are safe while on the water. 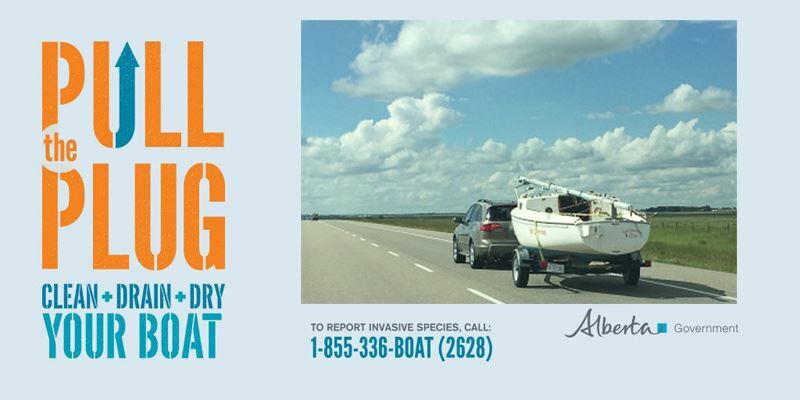 The City of Calgary Boat Patrol is out on the Glenmore Reservoir and can provide safety assistance if required. Statement of Risk and Waiver for sailing. Does my child need to be able to swim to go sailing? No. PFD's are mandatory (City of Calgary Bylaw) when anyone is on the Glenmore Reservoir. Comfort around the water is helpful. Are there any required prerequisites before going sailing? Not for the Level 1 course. Youth have two in-the-water skills - jump in chest-deep water wearing a PFD and blow bubbles in the water for 10 seconds which need to be achieved in a pool or other body of water as there is no swimming in the Glenmore Reservoir. How many youth can participate in one Scouting lesson session at a time? After about 8 or 9 years old, youth would typically go out in the Optimists individually. For younger / smaller youth, the Optimist sailboat can very safely be sailed by two youth at a time. There are two controls in the boat (rudder and mainsail) and the youth take turns steering and controlling the sail.